Donna Alward is the queen of domestic romance. How she manages to keep Miss Bates riveted with ordinary lives of ordinary people, doing no more than making dinner, watching TV, and drinking a beer at the local pub is a wonder. But that is exactly what Alward does: expose the soft core of her characters, their fears, vulnerabilities, dashed hopes and dreams, all the ways in which life has worn them down amidst everyday ordinariness. Alward is good at depicting characters vacillating between giving in to the fears received from life’s knocks and reaching towards hope, counting on love to renew them. This rich inner life is enacted amidst simple possibilities and domestic chores: a place to belong, meaningful work, a partner to love, a child to rear, and puppy to walk. Miss Bates says that Alward is the only romance writer she knows who has her rushing home from work to read her novels when the only exciting moment that makes up a scene is the flip of a pancake! Well, there’s all that and pancakes, chocolate-chip ones, in Alward’s latest romance novel, The Cowboy’s Valentine. Lacey Duggan returns to her childhood home, Crooked Valley Ranch, a woman who has lost much: her husband, hope for children, and career. Debt and a whole lot o’ sad are all she has. She’s part owner of the ranch with her brothers, Duke and Rylan, but she’s not interested in keeping, or sustaining it. Duke hopes to convince her otherwise. His ranch manager, on the other hand, the widowed, single-dad, Quinn Solomon, resents her disinterest. Lacey wants her life in the city back, her career, and hope to get beyond her marriage’s dissolution and job redundancy. She knows Quinn isn’t exactly keen to have her in the main ranch house, as Lacey characterizes him, “Quinn with the startling blue eyes and broad shoulders and long legs and cute daughter – and a low opinion of Lacey Duggan.” Their exchanges are antagonistic: city-slicker to silent cowboy, ” ‘This,’ he said darkly, ‘has absolutely nothing to do with my authority but a hell of a lot to do with yours. You own one-third of this ranch, but you’ve made it clear that you hate it and that it’s a last resort for you. Forgive me if that doesn’t make me feel all warm and fuzzy.’ ” Thus begins Alward’s antagonists-to-lovers romance and it’s a good one. Quinn and Lacey are split by mood, but joined by circumstance. Lacey is sad and vulnerable, but she’s a get-up-and-go gal, always trying to make the best of things, “She always rallied after being kicked around, and this time was no different.” By chapter two and frequent contact by virtue of living, Lacey, and working, Quinn, in the ranch house, their encounters are snappy, verging on acrimonious, thanks to Lacey’s characterization of Quinn, which is pretty spot-on, “He was surly. It was hard to like a man who hardly ever smiled.” Because mixed up in this acerbic mood are moments of sympathy, physical awareness, and cookies! Quinn and Lacey harbor a lot of pain: Quinn, as the loss of his beloved wife lingers and Lacey because she lost the life she thought she’d built for life: husband, children, dog, picket fence, satisfying work, all gone, “All she’d ever wanted was a normal life. Nothing fancy. The love of a good man, a home to call her own, a family to love and care for.” Quinn also comes with a moppet of cuteness and charm, and a bit of a lisp, Amber. The more Lacey and Quinn snap and snarl, the greater the love and fun Amber and Lacey share. The rug rat’s charm is infectious. When a fire damages Quinn and Amber’s home, the home they’d shared with wife and mom, Marie, Lacey offers to take them in. Lacey is a woman who, even more than career, needs people to love and nurture. Quinn and Amber need to be loved. Dinners, shared laughter, watching some TV in the evenings, making cookies, the tension of increasing physical awareness, bring Lacey and Quinn closer. Their bickering intensifies, but so does their liking and respect and their chemistry creeps up the sexual thermometer like a low-grade fever. One of Alward’s many talents at this romance thing is an ability to capture character, emotion, and key moments, moments that change the course of a relationship, that shift possibility into affinity. Quinn and Lacey’s seminal moment is captured beautifully: “Something passed between them, something that, for a flash, felt like shared grief. It was gone in the blink of an eye, but it had been there.” Miss Bates loved that this moment encompassed their difficult pasts, that “shared grief” is lovely. It is the beginning of sympathy. Liking, the back-and-forth between friendship and “this-is-something-more,” Alward is so good at relentlessly showing us what keeps these two apart and what brings them together. Moments, flashes, of understanding and sympathy, shared smiles … yes, Mr. Surly begins to smile. Then, Alward articulates Miss Bates’ favourite romance moment, recognition, that moment that goes beyond social, economic, familial personae to the elemental being, the man, the woman: “Lacey met Quinn’s gaze and saw something there she wasn’t prepared for. She saw beyond the ranch manager and her biggest critic and the single dad to the man beneath.” It is as if, as Miss Bates’ beloved Jane says, “we stood at God’s feet,” Adam and Eve, awakening to the Garden of Possibilities. Possibilities bring confusion, especially for Quinn, who feels happy yet guilty that he’s somehow abandoned Marie, betraying her every time he feels something for Lacey. His feelings for Lacey are conflicted: “He resented her. He appreciated her. And, as she rested a cool hand on his shoulder as she looked at the screen, he finally admitted to himself that he wanted her. He didn’t want to. All of it fed into this big ball of confusion that was centered in the middle of his chest, like a weight pressing down on his collarbone, making it hard to breathe.” Push-and-pull, desire and fear, of abandonment, loss, a new grief with a new person who can hurt by leaving. Quinn and Lacey share these fears, which unite them and keep them apart. Another of Alward’s great talents is to write adults who are decent and own up, admit they’re wrong. Quinn is powerfully attracted to Lacey, as Lacey is too to Quinn. Lacey is more forthcoming, at least initially, about her feelings. Quinn fights them, as the above “resentment” and “appreciation” can attest. But he also admits, ” ‘You see, I let myself get close, and then I get scared and then I push you away and I’m mean about it. It’s not your fault.’ ” Miss Bates thought that was a mighty fine soul-baring honesty, “I’m mean about it.” He is, but Lacey, once Quinn begins to relent also runs scared. In the end, Quinn has to make the grand gestures and Lacey has to overcome feelings of unworthiness … with a little help from the plot moppet. Lacey’s inability to get over certain things in her past and the presence of a plot moppet who behaves way too unrealistically, if the moppets Miss Bates knows are anything to go by, make The Cowboy’s Valentine just a notch less-than Alward’s near-perfect category of last year, Her Rancher Rescuer, but it’s still stellar Alward. In it, Miss Bates found evidence of “a mind lively and at ease,” Emma. 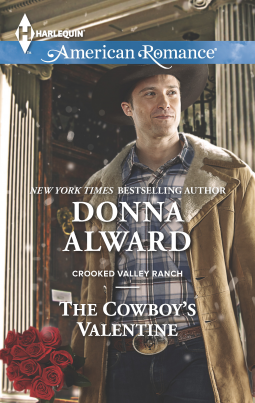 Donna Alward’s The Cowboy’s Valentine is published by Harlequin (American Romance) and has been available in the usual formats at the usual vendors since February 3rd. Miss Bates received an e-ARC from Harlequin, via Netgalley. “How she manages to keep Miss Bates riveted with ordinary lives of ordinary people, doing no more than making dinner, watching TV, and drinking a beer at the local pub is a wonder,” I thought of this quote: “You are now collecting your People delightfully, getting them exactly into such a spot as is the delight of my life; — 3 or 4 Families in a Country village is the very thing to work on,” from the mighty Jane of course. So, I was amused when a few paras later, there was your reference to Jane Austen as you described the moment of “soul mate” recognition as it were. I probably will never read this book, but I love reading your review of it! Thanks. Aw, thank you! It’s been a brutally unkind winter this year: we haven’t had a fair day since January 5th, nearly two months of extreme cold, then snow, then back to cold … it’s wearing us down. I too have been super-busy and have only managed four posts in February, an indication that I haven’t read as much as I’d like to. I love that Austen quotation! Alward is one of my favourite category writers, like Janice Kay Johnson, but without the plethora of cops and schoolteachers, she writes about everyday, lower-middle-class, or middle-class characters … and makes their love and romance so interesting!